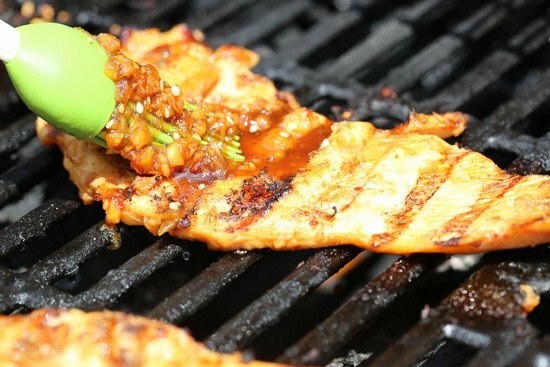 This is the BEST grilled chicken recipe! Not just because I’m obsessed with Korean food, it’s just so juicy and flavorful, and this is coming from a girl her prefers dark meat. It’s also quick and easy to make, perfect for weeknight grilling. The marinade is so good you’ll never want to buy the bottle stuff, I promise! You can serve the chicken over rice, or with a simple veggie slaw. If you make this, please come back and leave a comment telling me what you think – enjoy! Place the chicken breasts, 1 at a time, in a Ziploc bag. Pound the chicken breast to an even thickness, about ½ inch thick, being careful not to puncture the bag. 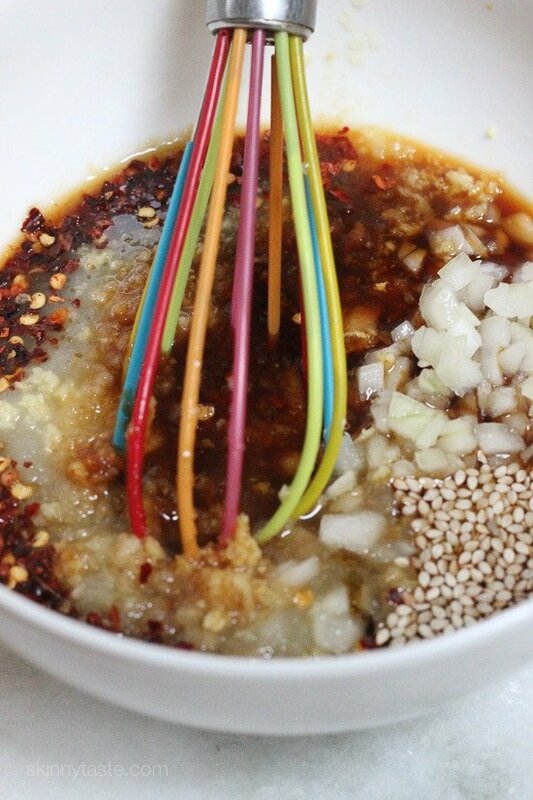 In a medium bowl, combine the soy sauce, apple sauce, onion, sesame oil, ginger, brown sugar, garlic, red pepper flakes, if using and sesame seeds. Reserve ¼ cup of the marinade and transfer the remainder to the Ziploc bag with the chicken. Refrigerate and marinate for at least 1 hour. Over medium-high heat, grill the chicken for 2 to 3 minutes or until it no longer sticks to the grill. Turn the chicken, spoon the reserved ¼ cup of marinade over each breast and grill an addition 2 to 3 minutes. I loved this and i only marinated it for 2 hours, next time 24hrs just to see if it can actually taste better! Bonus too, i didnt have any applesauce and made some myself, so easy! What can I use instead of the apple sauce? Don’t think I’ve ever seen this in the supermarkets over here in the UK. Thanks! You could buy 4 to 5 pounds of apples, core them, and then saute/simmer them down into a sauce. You could take the skin off first (if they are non-organic) or leave them on if they are organic. If you leave the skin on, you’d want to use a blender (immersion is preferable) to mulch up the skins after cooking. Homemade apple sauce is the best! This was delicious! I ended up cooking this on a stovetop griddle and it came out juicy and very tasty! It was a big hit at my house so I’ll definitely make it again soon! Are you cooking the chicken indoors? If so, what grill pan are you using? Another winner!!! This was really a great marinade. I would use it on a pork tenderloin, too. I made some coconut brown rice to serve with this chicken and added some snow peas. This will be on repeat in my house!!! Hi Gina, I noticed the video shows you topping the wraps with Gochuang sauce but it is not mentioned in the recipe. Do we need it? What is it? I am new to Korean food. Thanks! The recipe sounds amazing! This was a big hit with my boys (ages 11 and 14). It’s the middle of winter right now so I broiled the chicken for about 4 min each side. It turned out great. I also didn’t pound the chicken as my husband was able to cut the breasts pretty thinly. Be sure to try this recipe even if you don’t have a grill! ANOTHER fabulous recipe, thank you Gina! I live in rainy Vancouver BC so I broiled the chicken: 3 minutes one side, 5 the other; turned out perfect. My husband raved about it too. Thank you so much for sharing all your inspirational recipes! Am always amazed that I have most ingredients on-hand already. This was delicious! I will definitely be making this again. Thanks so much for sharing. Delicious! Made this with rice, loads of veggies and kimchi. It was a hit! I made this tonight and we really enjoyed it. I served it with coleslaw and grilled pineapple. Getting back to healthy eating after the holiday indulgence! Can i sub ground ginger for fresh and if so what is the equivalent amt ? Have this marinating now. I am using honey instead of brown sugar and coconut aminos instead of soy sauce. Changed the recipe to make it Paleo. Can’t wait to try it! Making cauliflower stir fried rice to go with it. This looks delicious. My husband is highly allergic to garlic (sad but true)! What would you suggest to use as a replacement? Made this for dinner tonight and everyone loved it. I have to say, i have made quite a few of your recipes and they’ve never failed. Delicious ? Thinking about using boneless skinless chicken thighs and skewering them, and grilling. I have Korean style red pepper, which I haven’t used yet. how much would I use to substitute it for red pepper flakes? Made this tonight. Everyone loved it. I used homemade applesauce and and used a little cayenne instead of red pepper flakes; it was delicious. Had lots of fun flattening the chicken breasts! Served with rice and steamed broccoli. Made this with coconut rice tonight *drools* So tasty! Your recipes are always delicious, yet simple to put together. Thank you! I didn’t have applesauce so I used cranberry sauce. It was AMAZING! Great marinade/sauce. Cooked on the stove top and was delicious. Might try the broiler tonight. Served with cauliflower rice. Great combo! Easy and delicious! The sauce was terrific–definitely make some extra to spoon on top. Delicious. Easy and fait. Yummmm!!! My husband and son loves the Korean food they ate while traveling there so I made this for them and they loved it! I was actually looking for a Korean beef recipe and I found one on another website but your marinade looked easier and called for a lot less sesame oil so I used your marinade recipe and flank steak. It was delicious! Thanks for so many great recipes! you used this same marinade on flank steak? or a different one from this site? How would this hold up in the oven instead of grill? I broiled this tonight: 3 mins first side; 5 mins the next. Turned out perfect! Fantastic marinade! Easy to make, very flavorful. No more bland or boring grilled chicken. Thank you, Gina! How can so few points taste so good? These are FABULOUS! I’ve grilled and air fried them. I love this recipe. I live in an apartment and don’t have a BBQ, so I baked them in my toaster oven at 400 F for 20 minutes and they came out perfect. No charred marks, sadly, but the flavour is there. What kind of veggie slaw would you recommend? Do you have a recipe for a good slaw dressing too? When do you add the scallions?? Hi Gina,Oddly enough, I did not have any applesauce on hand but I had a very ripe guava. I simply mashed the guava and added it to the marinade (no additional water or sugar). I grilled the chicken on my indoor girl pan, with pieces of guava chunks and it was delicious! I may try with papaya and other fruits in the future and get a unique side dish out of this recipe.Thank you! A Favorite family recipe! My daughter had to do a food/culture project for her class and she chose Korean cuisine so she could share this dish with her classmates. She calls it the “the best chicken she’s ever had!” The marinade makes the chicken so flavorful and juicy. Could you substitute apple butter for the applesauce? I made this tonight for my family and they were amazing. They were so moist and flavorful. I toasted a lot of extra sesame seeds to put on top at the end! This will be on our family menu from here on out! Made this for dinner last night with zoodles cooked in the King Pao sauce. Absolutely delicious. Love love LOVE this chicken!! So flavorful!!!! These have become one of my husbands favorites! I have the gojugaru sauce that i’d like to use in this recipe. How do you substitute? Do you still need soy sauce, and how much goju would you use? Would you still use the red pepper flakes and apple sauce? Amazing recipe – even the picky eaters in the family loved this one. Will definitely be making this again! It’s too cold to grill here now. Do you think you could cook these in the Instant Pot with the sauce? What is a good side dish for this? Found this recipe through Pinterest and this is now one of our family favorites! So good! Will this still taste delicious if I leave out the ginger? It would not be the same at all with the ginger, it’s probably the main flavor in the recipe. I concur with many of the posted comments. Your recipes are beyond delicious. I barely have leftovers. I love. Flavors and you certainly provide this in a million forms. Thanks a million for this awesome site and easy directions! Aww, thank you so much Debbie! That means a lot to me! This looks amazing (your chicken recipes always are).. but what do I serve it with? Wow wow wow!!! I cook pretty much exclusively from this site and everything is fabulous! Thank you!!! You’re welcome Rachel! Thank you! Tried the brown rice recipe: was row after 10 min. Took 40 minutes to cook. What am I doing wrong? We made this last night for dinner. Everyone loved it. Getting 4 out of 4 people to enjoy anything is a mini miracle in my house so we will be making it again. Easy to make and pefect for a busy night. We served it over rice. Thanks for a recipe that was flavorful, and healthy for us too. I couldn’t find the sauce locally. Can you suggest a substitute? They sell it everywhere including walmart or online. You could use Sriracha but not the same. Hi – making this tonite and looking forward to it. However, I get 4 points when I plug the info into the Weight Watchers site. Did you use the recipe builder? The only accurate way to determine any recipe’s SmartPoints® value is to plug the ingredients into the recipe builder on the Weight Watchers website (Click on “My Foods,” select “Recipe,” and click “Create a recipe.”) which does not count fruits and vegetables in recipes in the calculations as they are now 0 points. I saw this recipe on FB and was immediately drawn to it because of the marinade. I wanted to make it but only had a rotisserie chicken on hand. I forged ahead and made the marinade, shredded the chicken, and let it sit in the marinade for a bit. I quickly pan sauteed just to heat through. I used the meat in lettuce wraps. So good! It is all about the marinade for me! I would like to make tonight but don’t have any fresh ginger would ground work? If so how much? Thanks! I’ve got this marinating and ready to go on the grill tomorrow. I’ll serve with brown rice and grilled zucchini. Any idea if using the extra 1/4 cup of reserved marinade could be made into some kind of sauce for the rice instead of using it to brush on the chicken? Can this be made and frozen to use at a later date? Can you make this ahead and freeze for use on a later date? At what temp and for how long if baking in the oven? Suggestions please? Does it matter if you use toasted sesame oil or just sesame oiil? Made the Korean Grilled Chicken Lettuce Wraps tonight…AMAZING! The marinade is so good. I used cauliflower “rice” instead of brown for an even healthier version. One of the BEST chicken marinade’s I have ever had. Thanks for the recipes!! I have been on Weight Watchers for the past year, using your website exclusively for ideas. This recipe is off-the-hook fantastic!! Made it today for my husband and myself. We will have leftovers for tomorrow. Thanks for providing great variety and super tasty recipes! OMG! 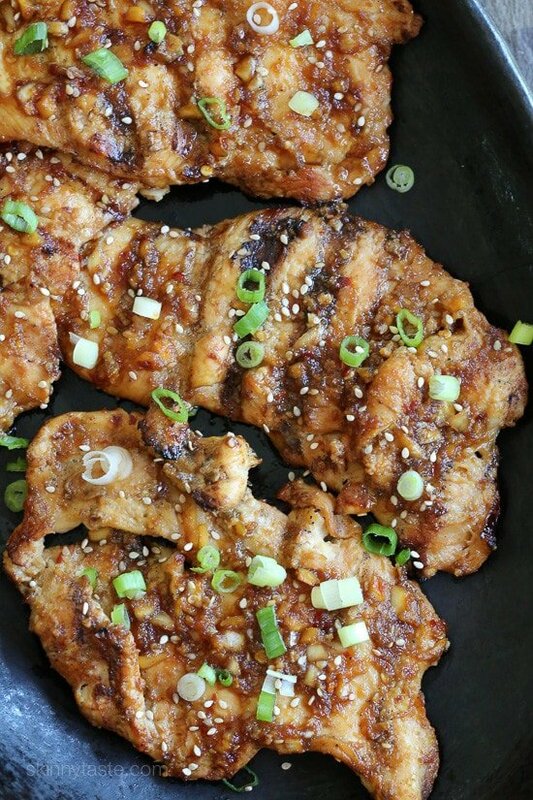 I made the Korean Grilled Chicken and it is to die for! So easy and so delicious! I made cauliflower rice to go with it and my husband flipped out over how good it was! Can this sauce also be used for a chicken and vegetable stir fry? This turned out really good, I added it to my favorite meal rotation. I cooked it in a pan on the stovetop and the second time I made a stir fry and it was excellent. I use truvia brown sugar blend as a substitute for brown sugar and I did not have sesame oil so used regular oil.. This was really really good. We made it just like the video with the sauce/rice and let’s. My son at what I had left over that night, I had intended to save the leftovers for lunch. Also, Hoisin Sauce is good too on this.. My husband really liked it to so this is kid and dad tested! Its a hit. This was really awesome. In fact so much so that my son ate the left overs that night that I had intended to make for lunch. Also, Hoisin Sauce is good too on this.. My husband really liked it to so this is kid and dad tested! Its a hit. Made these for dinner tonight and they were delicious. I had a spicy sauce similar to the one you suggested that gave extra heat. I’ve yet to make one of your meals which we didn’t enjoy! I just cooked this for dinner and it is GONE! The kids ate it all! This taste delicious!!! Sooooo good! I was gonna take some for lunch! Looks like I’ll be making a sandwich! I love Skinnytaste & have one of your cookbooks. Could you please do some recipes for the InstantPot? I bought one for the time issue & would love to use your recipes. I have quite a few Instant Pot recipes, just put that into the search on Skinnytaste. We had this for dinner tonight…DELISH!!! I doubled the recipe and we had them in lettuce wraps with thinly sliced carrots, cucumbers, radishes, and topped with Sriracha! Thanks! We will definitely have this again! Jenn, thanks for the additional inspiration for the two extra pieces I had DH grill last night. This was so good served with rice and grilled veg, but I Love it when I can plan for and serve leftovers in a slightly different way. I loved this recipe. Grilled on George Foreman grill. Turned out wonderful! Out of curiosity – when do you add the green onion? The instructions list ‘onion’ which I assumed was just the yellow onion, but maybe I’m wrong. I was wondering this too… I guess I will just add it in with the marinade. Wow! So easy, tons of flavor and the chicken was so tender (I did use organic breasts). I didn’t have applesauce so puréed 1/2 a small apple, and added a healthy dash of red pepper flakes rather than the optional teaspoon. I will definitely be making this all summer, it was my first grill of 2017 – bring on the warm weather! 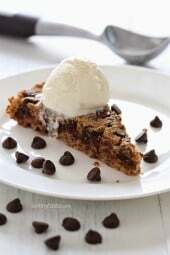 Gina thanks for this recipe…..I have made it several times and my family loves it; however, I am wondering about the points; I just joined weight watchers and when I put the calculations in (on their website) it comes up with 4 points, not 3. Hey, I’m a Korean-American and I make bulgogi similar to this recipe. For this recipe, I just blended the apple,onion,ginger, and garlic together because I find that easier to do. Also I added more gocharu than the recipe called for because I love spice! I let this marinade sit for about for hours. For people that are wondering, the apple adds a great flavor and also tenderizes meat! I would use a fresh apple blended rather than apple sauce though. Thank you for this wonderful recipe. I make this regularly and my entire family loves it. It’s quick, easy and so yummy. I serve this with rice for my family but I eat it with rice cauliflower. Fantastic recipe! It turned out amazing. Thank you! Do you think this recipe would work in the crock pot? It might, but more shredded. The taste would change. Can I cook the choken in the oven instead of grill. This was delicious and except for waiting an hour for it to marinate ,it did not take long . Also I had all the ingredients and it was last minute. Loved it and I will plan to make this chicken again.I am a WW and really appreciate your recipes with the freestyle points values. What makes it Korean? I expected to see some Gojuchan sauce. Just curious, it sound delicious. Your recipes are always awesome. Thanks for sharing! 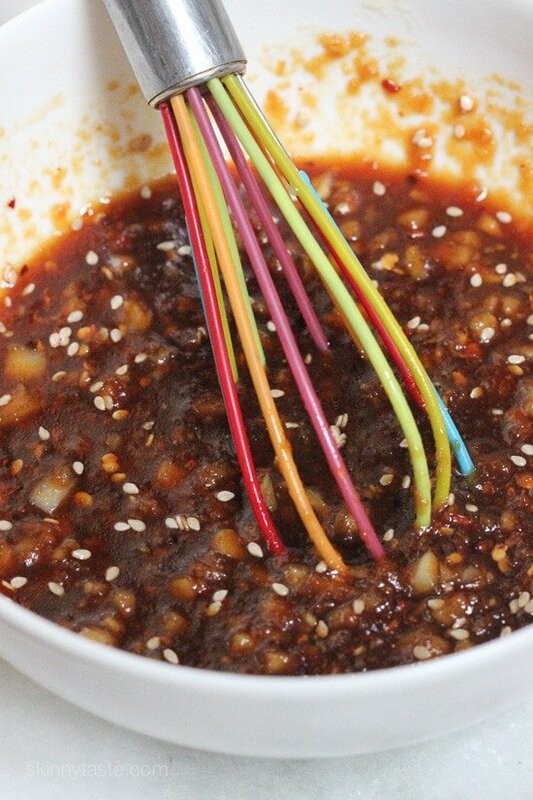 It’s very close to a traditional Korean marinade. Instead of applesauce, a grated Korean pear would be used, no yellow onion – only scallions, and the red pepper flakes would be the Korean variety Gojugaru, instead the standard red pepper flakes (it’s made from a totally different pepper). But this is very close to what you’d find in any Korean household. You could use Gojuchan if you have that. It would taste great too! What do you suggest as a side dish for this? I would do rice and edamame or broccoli. We’re doing steamed rice and boiled carrots tonight. I made this for dinner tonight, and it was excellent!! 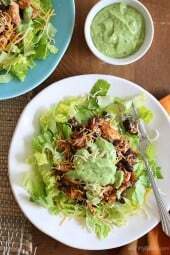 My husband and I have been on a weight loss diet, and lots of other recipes I have tried are just so-so. All of the recipes that I have made from your postings have been delicious. Thank you so much for your help in making our weight loss plan more flavorful. Do you have a cookbook? To purchase? Yes, 2 of them. Skinnytaste, and Skinnytaste Fast and Slow. You can find them on Amazon. I have Skinnytaste and love it. I used to think that if I got a few good recipes from a book, I did well. This cookbook surpasses any others I have bought by far – I love and frequently make many of the recipes in Skinnytaste! It was a hit. I didn’t have apple sauce so I pureed an apple. Turned out very tasty and the chicken stayed moist….and the addition of the chili flakes was a good amount of heat. Will make this again for sure. Oh…btw I baked it I didn’t grill it. I was just wondering about others ways to cook this. It’s marinating but its raining cats and dogs here so I cant grill. Baking it is. i only have applesauce with cinnamon, do you have a substitute that i can use? Oil perhaps. I think the applesauce is there for flavor and not a replacement for fat (like you would use for baking)….perhaps you could puree canned pears or use apple juice. I’ve used chicken broth instead of the applesauce and it works great! Jamie, & others who might wonder, I realize this has been up a while. I had the same no applesauce concern! I use 1/2 fresh apple (with skin), put all ingredients in blender or just pulse the apple with the soy sauce, then continue as written. I don’t worry about having applesauce on hand. We usually eat Honeycrisp or Gala, so that’s what I use. I think any flavorful apple would work well. 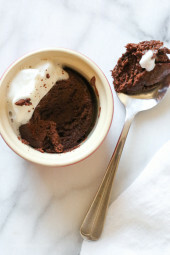 We love this recipe-thanks Gina! Would this recipe be good with pork chops? Made this last week for dinner, and my husband has requested it again today. It’s a hit! Thank you for your hard work. Our dinners are almost exclusively from your website. Had this for dinner last night, this was so good. We will have this regularly. Just want to say thanks for the great recipes that lets us watch our calories but I still get to have fun in the kitchen.